The wife of former interim UFC lightweight champion Tony Ferguson files for a restraining order against her husband. 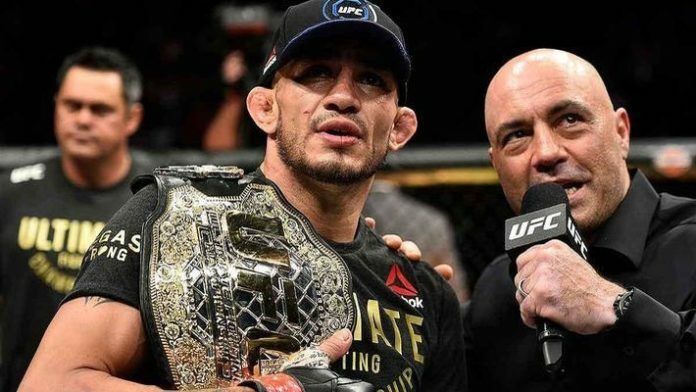 Former interim UFC lightweight champion Tony Ferguson’s wife, Cristina Ferguson, has reportedly filed a restraining order against the mixed martial arts (MMA) star. The restraining order was filed Wednesday (March 13, 2019) in Orange County California Superior Court with an ex-parte hearing taking place the same day. An investigation has been scheduled for March 22nd by the court’s domestic violence prevention services project. Also, a domestic violence hearing has been scheduled for April 5th. No details regarding the specific allegations Cristina has made against Tony have been made as of this writing. MMA Junkie obtained five police reports that detail disturbances from the Ferguson home dating back to January of 2018. The restraining order against Ferguson comes a week after six police units were dispatched to Ferguson’s Santa Ana home. Cristina told police that she was at her parent’s home in La Mirada this past Friday (March 8, 2019) when Ferguson took their 2-year-old son back to their house. Ferguson then changed the locks on the doors to the home. Cristina didn’t fear for their child’s safety and officers left after determining there was no custody order and no crime committed. An unidentified male who called the police revealed that Ferguson told him “someone was inside his walls.” Two hours after police made contact, Cristina said Tony’s trainer was unable to get him to leave the house and see a doctor. Three days later on February 16th, Cristina called police from a nearby park after leaving her home. She said that, while Ferguson wasn’t violent towards herself or anyone else, she was concerned for her husband’s well being. Cristina claimed “he kept throwing ‘holy water’ at her,” and that his condition – which was redacted in the report – had bee worsening. Tony refused to go to a hospital for an evaluation. Once officers showed up to the home, Tony was adviced to go see a doctor, to which he agreed. After not being deemed a danger to himself or anyone else, Cristina was still advised to go with her child to her parent’s house. Multiple of the police reports note of Ferguson’s occupation as a UFC fighter and suggest multiple units for responses to his home. It was also noted that Ferguson owns a taser. Back in January of 2018, police were called on two separate occasions for family disturbances. Tony’s own father said his son was “out of control” and kicked him out of the house. Tony also reported his wife, Cristina, missing overnight. What do you think about Ferguson’s wife filing a restraining order against him?